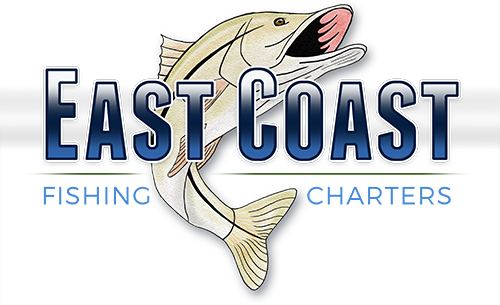 Welcome to East Coast Fishing Charters! 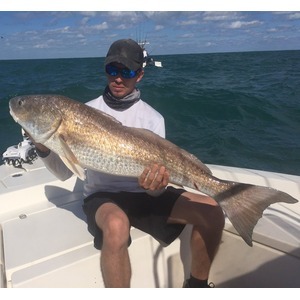 Fishing Charters in the Sebastian Inlet, Vero Beach and Melbourne areas. Starting off the New Year with a Bite! 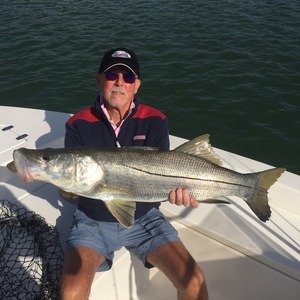 With over twenty years of experience, Captain Don knows the Vero Beach, Sebastian Inlet, and Melbourne area waters in and out. He grew up fishing these waters, and will be able to take you to some prime REEL estate! 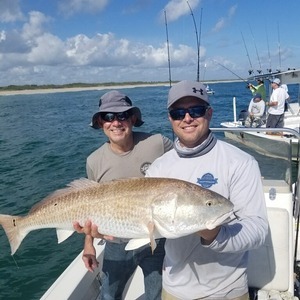 Whether you're new to fishing or an experienced and ardent angler, Captain Don will make this fishing trip truly memorable, he has an extensive knowledge of the lagoon, and knows plenty of tips and tricks to find the fish and have an exciting, memorable day on the water. 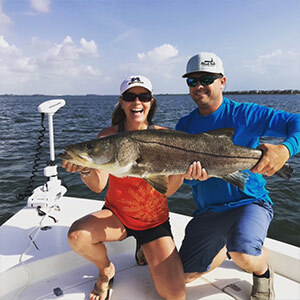 Book a trip with EC Fishing Charters and allow Captain Don to guide you along an exciting saltwater experience on the alluring Indian River Lagoon. Venture through the waters of Sebastian, Vero Beach, and Melbourne. The east coast of central Florida is home to an incredibly diverse inshore saltwater environment visited by top anglers. You can hunt down giant Tarpon or Snook around the Sebastian Inlet. You can sight fish the flats and shallows of Vero Beach, and surrounding areas. 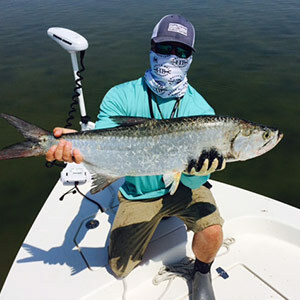 The Indian River Lagoon is the area where not one but two state records were set for Spotted Seatrout and Redfish, and there's plenty more for you to hook!! Let Captain Don provide you with the experience of a life-time. We promise to provide our guests with stellar service. Call now to book your fishing trip today! A great fishing boat charter is to have a captain who knows the right water temperature, right tide, and which bait to use. 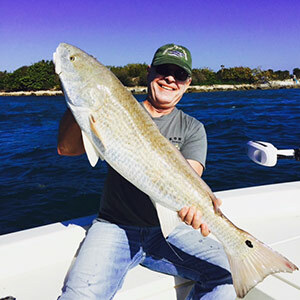 With over twenty years' experience fishing Vero Beach, and Sebastian Inlet, Captain Don has it dialed in. So, if you're looking for an exceptionally memorable, fun, and exciting fishing experience, Captain Don's charter is the charter for you! Did you know that the Indian River Lagoon is the Most diverse estuary in North America, with over 700 species of fish. The Indian River Lagoon actually groups together three lagoons. There are dozens of smaller rivers and streams that flow into the Lagoon and due to varying salt levels and the fact that the northern section of the lagoon is located in a temperate climatic zone while the southern section is subtropical, this allows for the highest biodiversity of ANY lagoon ecosystem. This prime fishing area is centrally located in Florida so even if you're not necessarily on the coast, it's a short drive to your very own fishing adventure. Approximately an hour is all that stands in your way of an amazing experience. That's right, the beautiful Indian River Lagoon is about an hour or less drive from top destinations in central Florida including Orlando and Walt Disney World and is minutes away from the Kennedy Space Center. Vacationing to central Florida? It is a must to come fish the Indian River Lagoon, for the best saltwater experience of your life. Starting from Ponce de Leon Inlet in Volusia County to Jupiter Inlet in Palm Beach County, Florida, the Indian River Lagoon stretches 156 miles, moving through areas like Vero Beach, Sebastian and Melbourne. Visiting the Indian River Lagoon is an experience that will last a lifetime. Snook have a very distinctive body shape. They have long concave snouts, and jutting underjaws, a prominent lateral line that is dark or black running the full length of their body, into the tail. Coloration of Snook varies and is generally dark grey or brown to black, and silver on the sides and had has yellow tinted fins. The two dorsal fins are well separated. Snook like to surprise attack their prey as it swims or moves into range, they are "ambush feeders". This happens especially at the mouths of inlets, where currents help the Snook who wait in hiding behind rocks, bridge pilings or submerged structures. Snook are awesome game fish, they can jump and make long, high speed runs. 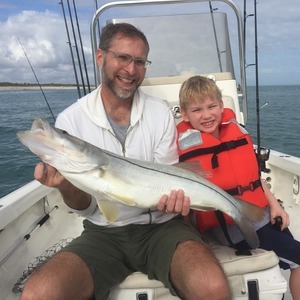 Snook can be caught in the middle of mangroves, around wrecks and reefs, near docks and piers and in the surf, they can also be caught with live or artificial bait. Snook can grow to over four feet and weigh over 50 lbs. 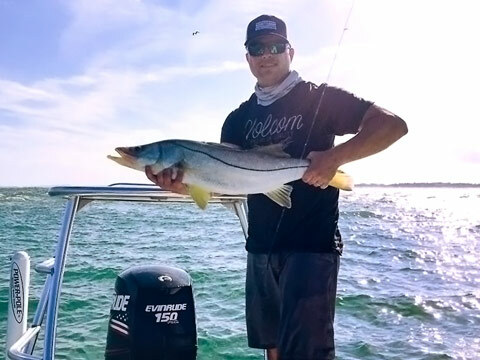 The majority of Snook caught range between 20-40 inches and 5-30 lbs. State record in Florida is 44 lbs. Snook are also good eating, with a delicate mild flavor. The color of the redfish ranges from a dark red to deep brownish, coppery color to nearly silver. Redfish have extremely distinguishing marks, such as a large black spot on the upper part of the tail. Multiple spots are not uncommon, but no spots are rare. It is believed Redfish have the "eye spots" at the top of their tail to confuse predators into thinking the tail is their head thus giving the fish an opportunity to swim away, if a predator strikes. Redfish are also known as Red Drum for the drum like noise that they make when they are in distress or spawning. They produce this sound by using certain muscles to rub against the inflated air bladder, like a finger rubbing on a balloon. Redfish can be caught from less than 1 lb. to 10-12 lbs. 30 pounders are not rare. Potential in Florida could be up to about 60 lbs. The Florida state record is 51 lbs., 8 ounces, caught right near Cocoa. A good way to fish for Redfish is by floating a live shrimp under a popping cork. They also chase mullet, pinfish, killifish (mud minnows) and crab. Sight fishing is popular for Redfish for a few reasons, one because their fights are often tackle testing, long and drag screaming. After hooking a Redfish, fights can last thirty minutes to an hour. You can usually find Redfish tailing on the flats, this is when a redfish tilts down to pick something up off the bottom and their tails rise out and above the surface of the water. There's one place in the world where the big adults, also known as Bull Redfish don't move offshore, and that's the Indian River Lagoon. As many as 700,000 people a year come from all over the world for this reason, Giant Redfish. Also, great to eat. The coloration of the trout or Spotted Seatrout is greenish dark grey above with some light blue tinges to a silvery white below. Extending to the dorsal fin and tail there are numerous distinct round black spots on back. At the tip of the lower jaw one to two prominent canine teeth are usually present. Soft dorsal fin with no scales. Trout can get up to 20 lbs. The average size it ranges from 3-15 lbs. and 19-32 inches in length. The state record for trout in Florida is 17 lbs., 7 oz., caught near Fort Pierce. Seatrout are one of the top game fish in Florida as they are an aggressive fish that will strike pretty much anything from spoons, jigs, top water artificials, various fly patterns and live bait. They can be found near bridges, grass flats, jetties, piers, docks, bays, tidal creeks, and in the surf. When Seatrout are larger than about 6 pounds they are referred to as gator trout. East coast of central Florida provides an excellent sea grass habitat with a lot of food to grow large gator trout! 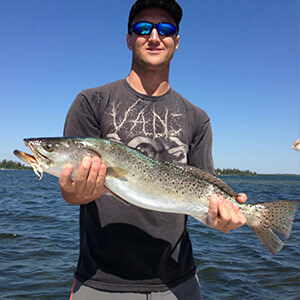 Trout over 10 lbs., are routinely caught throughout the year. Due to their size and coloration, these fish are easy to recognize. Tarpon have a greenish or dark blue back, large silver scales, a big upward opening mouth, forked caudal fin, and a dorsal fin that extends back. There are a few fish that possess a swim bladder as unique as the Tarpon. The swim bladder acts as a lung, allowing Tarpon to have the ability to breathe in air. They take the air in by "rolling" at the surface and gulping. Tarpon are known for their acrobatic displays, their initial jumps and very powerful runs. Most of the Tarpon that are landed are between 25-80 lbs., however they can range from just a few inches to about four-eight feet in length and weigh up to 300 lbs. The state record for Florida is 243 lbs., caught in the Florida Keys. While fishing for Tarpon you can use live bait such as crabs, shrimp, mullet or pinfish. Artificial bait can also be used though. Mature Tarpon are carnivorous and swallow fish smaller than them whole. Tarpon is great game fish but are not good eating because they have a lot of small bones throughout their bodies, making the meat hard to fillet.